Defined by the idea of movement, Migration is dedicated to exploring Pinot Noir and Chardonnay from the finest cool-climate winegrowing regions to create wines that highlight lush fruit, bright acidity and impeccably balance oak. Established in 1973, Bien Nacido has earned a reputation as one of California’s premier vineyards. Planted in the low-vigor soils of the Santa Maria Valley, the vines face the full force of the wine and fog off the Pacific. The result is a Pinot Noir that balances richness and elegance with blackberry and ripe strawberry flavors underscored by enlivening acidity and notes of green tea and spice. 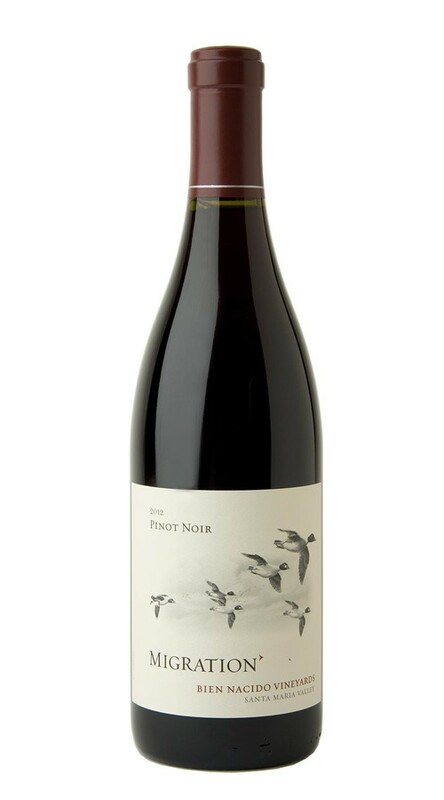 This is a classic expression of Bien Nacido Pinot Noir, with rich aromas of blackberry and white pepper, alongside subtler notes of leather, moist earth and pomegranate. On the palate, refreshing acidity balances this wine’s power and structure, while adding length to its flavors of blackberry, cassis and savory spice. With near-ideal temperatures throughout the growing season and no significant heat events, we were able to set an excellent crop and achieve optimum ripeness. We further enhanced quality by dropping any grape bunches that did not meet our exacting standards. This helped the remaining fruit to develop concentrated varietal character, which resulted in wines that are dark, full, flavorful and very well balanced.